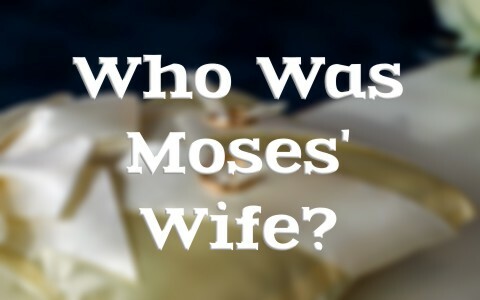 Who Was Moses’ Wife? Was Moses Married? Who was Moses wife? Was he even married and was their some sort of controversy about his wife? Moses was born at a time when Pharaoh was trying to have all the male babies killed. Somehow, Moses survived by keeping him hidden and then by God’s providence, his mother floated him down the Nile and Pharaoh’s daughter found him. His Hebrew name, “Mosheh,” means “drawn” as in “drawn out of water.” Hebrews 11:23 says “Moses, when he was born, was hidden for three months by his parents, because they saw that the child was beautiful, and they were not afraid of the king’s edict.” There are many different images of Moses in the Bible, one of which is that Moses is a forerunner for the Lord Jesus Christ in some ways. Moses led Israel out of Egypt like God leads us out of sin by His power and His Son, but for now, Moses is our focus and Moses ends up in Pharaoh’s house. This meant that “Moses was instructed in all the wisdom of the Egyptians, and he was mighty in his words and deeds” (Acts 7:22), was likely trained in the sciences, geography, mathematics, astronomy, architecture, and most of the other disciplines known to Egypt. Moses was not only highly educated, he was about to become a natural leader. After Moses received most of his training in Egypt, He had it made. He was in Pharaoh’s palace and had access to all of the riches of Egypt and to all of the women too. He could have been the next Pharaoh, but Moses “refused to be called the son of Pharaoh’s daughter, choosing rather to be mistreated with the people of God than to enjoy the fleeting pleasures of sin. He considered the reproach of Christ greater wealth than the treasures of Egypt, for he was looking to the reward” (Heb 11:24-26), and so it was “By faith he left Egypt, not being afraid of the anger of the king, for he endured as seeing him who is invisible” (Heb 11:27). So Moses fled into the wilderness for forty years, which is known as a number of testing, and there in the desert, he encountered the Living God at the burning bush (Ex 3:2-6; Acts 7:32-35). When Moses appeared at a well, there were other shepherds there monopolizing the water for their sheep and the seven daughters of Jethro always had to wait till they were finished. Moses saw this and defended the man’s daughters at the well, taking on all the shepherds and soundly sent them away. That’s when Zipporah, the daughter of Jethro, brought him back to Jethro who asked him to live with him and work for him as a shepherd (another symbolic reference to Jesus). Moses later married Zipporah (Ex 2:21), so Moses was definitely married. Did Moses Have More than one Wife? There is no biblical evidence that Moses was ever married to more than one woman. Exodus 4:20 records the fact that “Moses took his wife and his sons and had them ride on a donkey, and went back to the land of Egypt. And Moses took the staff of God in his hand.” That is singular in regards to his wife. There was some controversy, but not because Moses had done anything wrong, it was more of a matter of jealousy as “Miriam and Aaron spoke against Moses because of the Cushite woman whom he had married, for he had married a Cushite woman. And they said, ‘Has the Lord indeed spoken only through Moses? Has he not spoken through us also?’ And the Lord heard it” (Num 12:1-2). The complaint wasn’t that Moses had more than one wife but that she was a “Cushite woman.” Remember that Moses was married before God called him. Zipporah wasn’t an Israelite, and may have even been a Cushite, but at that time, Israel wasn’t really a nation as much as they were a slave-labor force. God was going to change that and use Moses in a powerful way to bring Israel out of Egypt. Miriam and Aaron’s complaint wasn’t really about Moses’ wife but about Moses having all the authority. It bothered them that God would only speak to Moses, but that was not their choice, it was God’s choice. To grumble against God’s leader is to grumble against God Himself, and that’s bad; very bad! Miriam and Aaron both paid for it, but Miriam got the worse of it with leprosy, probably because she had started the whole thing, however God held Aaron responsible for going along with it, but God’s hand was not as severe on him. Moses has a huge place, not only in Jewish history, but in Christian history. Moses’ achievements were many, but because he was meek and humble, he acknowledged that it was through the power of God and Moses will forever have his name associated with the law, as in the Mosaic Law and Moses’ Law. He continued to be a prominent figure among the religious leaders in Jesus’ day. In fact, they were constantly testing Jesus by using the Mosaic Law in trying to get Him to break it. He never did, and they never succeeded. It is on the Mount of Transfiguration that we get our last “glimpse” of Moses, as Peter, James, and John saw that Jesus “was transfigured before them, and his face shone like the sun, and his clothes became white as light. And behold, there appeared to them Moses and Elijah, talking with him” (Matt 17:2-3). Was this a peek into the kingdom of God when it’s established here on the new earth as the New Jerusalem descends out of heaven (Rev 21:1-4)? It seems that these two men represent the Law and the Prophets, and Jesus represents the fulfillment of them both? This seems to show that Moses will also play a prominent role in the coming Kingdom. There have always been grumblings against church leaders like pastors, deacons, elders, worship leaders, and ministry leaders. That’s never changed. It happened in Moses’ day and it’s happening today. We can’t change that, but we can choose to not be a part of the problem; instead we can be part of the solution. Pray for those in authority over us. Ask God to keep them from harm and that they stick close to your Word of God. Ask that God keep them grounded in teaching His Word but to do so with all humility. Moses was said to be the meekest man on earth (Num 12:3), but meekness is not weakness. Moses was anything but weak, but meekness is having strength that remains under control. Moses did grow angry and it kept him from entering into the Promised Land, but as we’ve read, Moses is already in the Promised Land (Matt 17:1-4), because any place where Jesus is, is heaven itself.